I just got this great Clean Skin Kit and I love it. I got it for my daughter who is nineteen and having a really hard time with acne right now. This set is really nice it comes with five different items. You get face wash to cleanse which is used daily to help neutralize any current acne as well as prevent any future acne. You get the activate solution which is a pore exfoliating toner to help open and treat the pores. You get the correct solution that is an oil control treatment to help reduce oil. You get spot treatment so you can target any of those really persistent areas that need some extra treatment. Finally you get the regulate which is a multi-vitamin to help improve nutrient intake and prevent future acne. My daughter has been using this set for about a week. She has already seen great results. Her skin is more vibrant. She reports that the solutions feel amazing on her skin and that they make her skin feel softer and more hydrated. Her acne has improved even after just a week. It’s working great for us so far! Like good health, radiant skin is built from the inside out. Our CLEAR SKIN KIT is formulated with the most effective dermatologist-recommended ingredients to help clear breakouts, absorb excess oil, reduce the appearance of enlarged pores, and improve skin tone and texture. 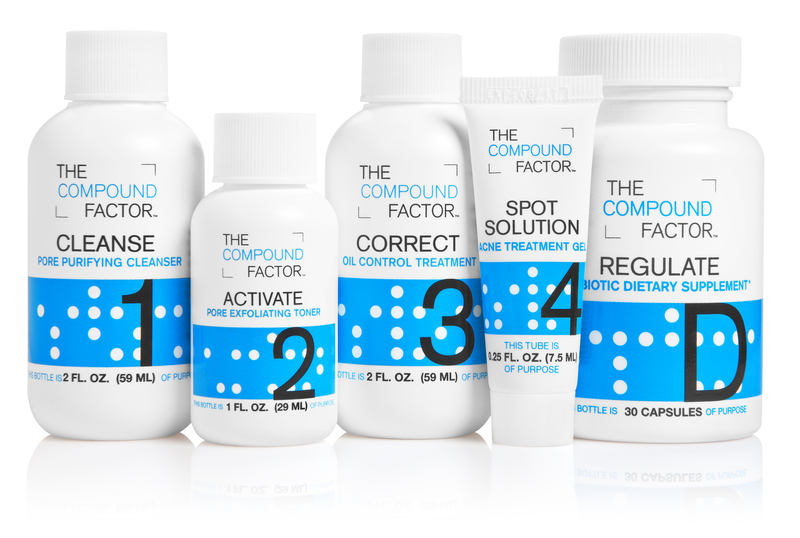 The Compound Factor CLEAR SKIN KIT includes everything you need to build healthy skin. Our 4-Step CLEANSE, ACTIVATE, CORRECT and acne-fighting SPOT SOLUTION provide a total skin care regimen, along with our REGULATE daily supplement to help control blemish-causing bacteria in your body. You can purchase it on the Clean Skin Kit Website!